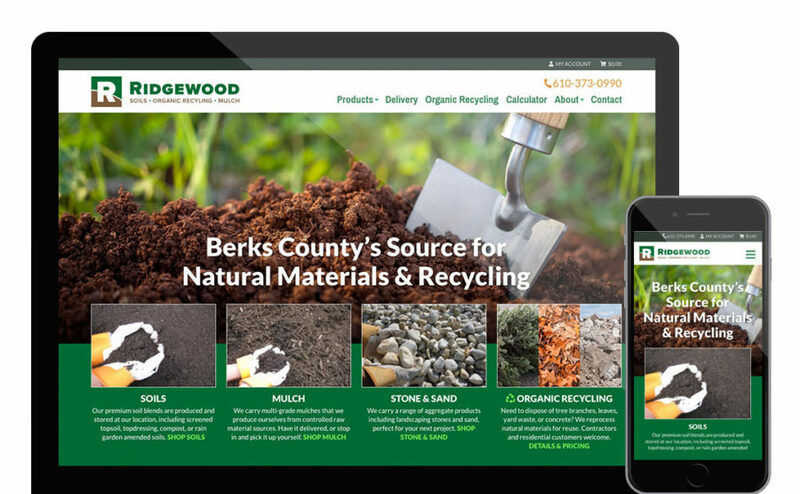 New E-commerce Website for Ridgewood Soils - Yoder Design Co.
Custom-designed WordPress website that includes a WooCommerce-powered online store. Ridgewood Soils near Reading, PA needed a logo refresh and an updated website. They previously had two websites – a main business website, and a separate website for their online store that wasn’t mobile friendly. We were able to combine the two sites into one, and add a lot of customer friendly features to the online store in the process. Every e-commerce situation has unique challenges, and this was no exception. We had to set a minimum order for each product as 2 cubic yards. We also had to only offer delivery for specific zones that were defined by ZIP codes. Additionally, we added support for commercial customers that gives wholesale-only pricing and payment terms. Visit the site at ridgewoodsoils.com. March 26, 2019 | Posted in: Uncategorized.